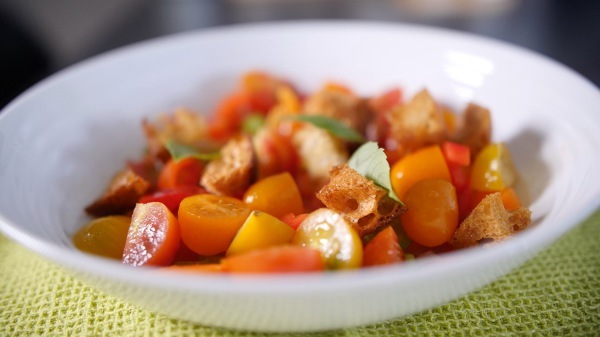 You will get all the ingredients for Scott's Panzanella salad below. ​​​​​Prep time 8 minutes, Oven time 20 minutes. Start by cutting the 420G sourdough loaf into chunks, then in the oven at 180º for 20 minutes untill they turn golden brown with a crusty texture. Meantime you can prepare the lemon dressing squeezing half a fresh lemon into a containor adding double the ammount of olive oil adding salt and pepper. Shake the containor to mix the lemon and olive oil, you can add a tablespoon of honey if you prefer a sweeter taste. The salad is made up of chopped celery, raddish and a carrot with some mediteranian multicoloured tomatoes (Tesco Finest Mixed Baby Tomatoes 250G). You can add pepper, avicado, onion etc as an alternative to the shown ingreedients. Once the bread chunks are ready mix into a bowl, drissle some lemon dressing and add a wee bit of basil...job done.